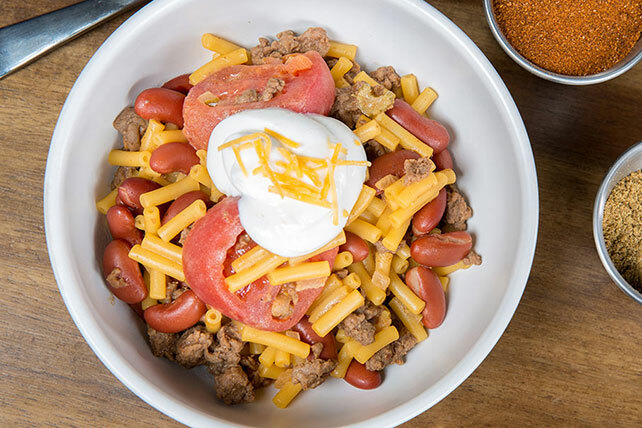 It’s the beans that give this smart chili mac the right to the title “Chuckwagon." Make it at home, on the range, in 20 minutes flat. Prepare Dinner as directed on package, using the Light Prep directions. Meanwhile, brown meat with chili powder and cumin in large nonstick skillet on medium heat. Add tomatoes and beans; simmer 3 min., stirring occasionally. Stir in prepared dinner; cook 3 to 5 min. or until heated through, stirring occasionally. Top with sour cream and cheese. Stir in 2 Tbsp. chopped fresh cilantro.